Vishal Bhardwaj is famous for making the films which are often not considered as Bollywood mainstream films. Being a literary lover he have special place for Shakespeare drama’s in his heart. He tried to adapt the famous Shakespeare dramas through Hindi films Maqbool (Makbath), Omkara (Othello) earlier; and now he came with Haider which is modern day adaptation of Hamlet which is explored on Indian canvas. First things first, the movie is not for everyone. If you want to watch the movie for the sole purpose of entertainment then this may not be your cup of tea. If hard hitting emotional drama is what you like and have guts to accept the harsh realities and hardship of real life then you can go for it. It is not easy to convert a famous drama (or in fact any form of literature) onto the cinematic canvas. The main three things you need to bank on are the script, its execution and performances. The script writer have tried to adapt the original drama on the canvas of Kashmir – India. It is the land which is referred as the heaven on Earth. And let us face it, it is not land of peace always. The shadows of terrorism affects the people living there in brutal ways. This tragedy (tragedy is always a key point in Shakespeare drama) is explored in the film effectively. The scriptwriter and director took bold steps to bring some of the real incidents without showing any bios. Take an example of the doctor treating a terrorist and reaction of armed forces against it. As the doctor is trying to be honest to his profession where the health and life of a patient is above then everything else. It doesn’t matter that if the patient is a good man or the bad. How can he let a human die without giving him treatment? Then think about the soldiers point of view for the same incident who had seen his buddies and countryman brutally suffered by the actions of the terrorist. How can he approve of the terrorist getting cured (to do more wrong things)? The writer/director chose not to come to any conclusion there. But rather show the events and let viewer view every side of the con. The end of the movie is tragic. In terms of performances we can say that everyone have tried his/her best to give it to the film. But, the protagonist is the one who always catch your attention. So if Shahid’s performance is a little dull then the effect of the entire movie will be faded. We must say Shahid tried really hard to be the character and he is convincing. And, by performance, we are not talking his decision to to shave off his hairs. There is much more than that. His journey from a soft spoken youth to a brainwashed terrorist is explored with power packed performance. 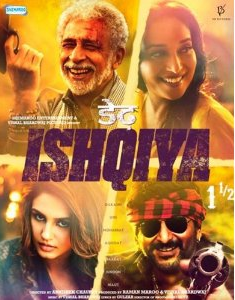 Tabu and Kay Kay Menon both are seasoned actors and known for their fantastic acting abilities; they are first rate in this movie as well. See Kay Kay Menon singing a folk song and Tabu giving joyous expression there when Shahid enters (who is sad due to what happened to his father and got shocked with this unexpected environment he see in his home); it will be tough to decide who is better actor. Shraddha has not much to do in the movie, but whatever she needs to, she does with sincerity. It is a good choice by her to keep showing her acting abilities by doing movies like this and commercial movies parallel. It is very similar thing Tabu did in the beginning of her career, which established her as a commercial actress with superb talent. Narendra Jha is convincing. Irrfan is in his usual form. The dialogs are first rate. Script has a chance to have some improvements for sure. Direction is flawless. The background music lives up to the expectations. If some of the songs were better, the value of the entire album will be better. The makers then could recover the production cost from the music album only. Vishal is a multi-talented person and he did justice to all the responsibilities he took. The locales are explored nicely. The cinematography is superb. Overall it is a good movie with a lot of positive aspects. If you are willing to watch emotional, tragic, action drama and not a light weight, entertainment-only movie, you can go for it, for sure.